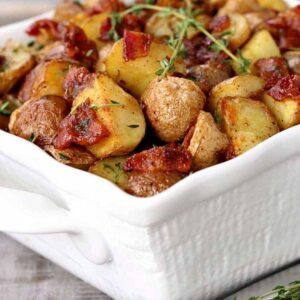 Try these Crispy Oven Roasted Bacon Potatoes as a side dish for any dinner! 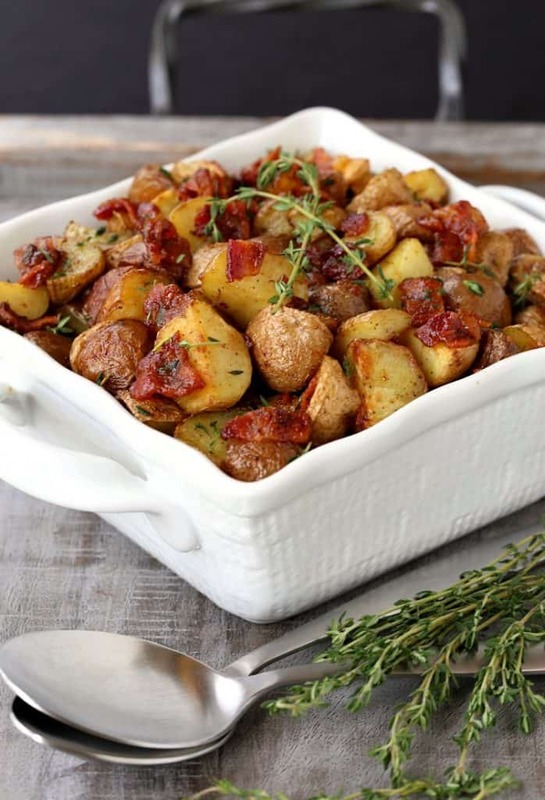 These delicious potatoes are oven roasted until crispy then tossed in a warm bacon dressing! I love potatoes. All kinds, mashed, fried – french fries are on the top of the list – potato salad…I don’t think there’s a potato that I’ve met that I didn’t like. Truth is that I used to be a solid meat and potato guy. And chicken, you could throw some of that in the rotation but meat and potatoes were my top choices. Obviously though since having the site here, I’ve expanded my food options by about a million times. I love trying new foods now, actually now it’s become sore of a hobby…looking for the next thing to put here on the blog. 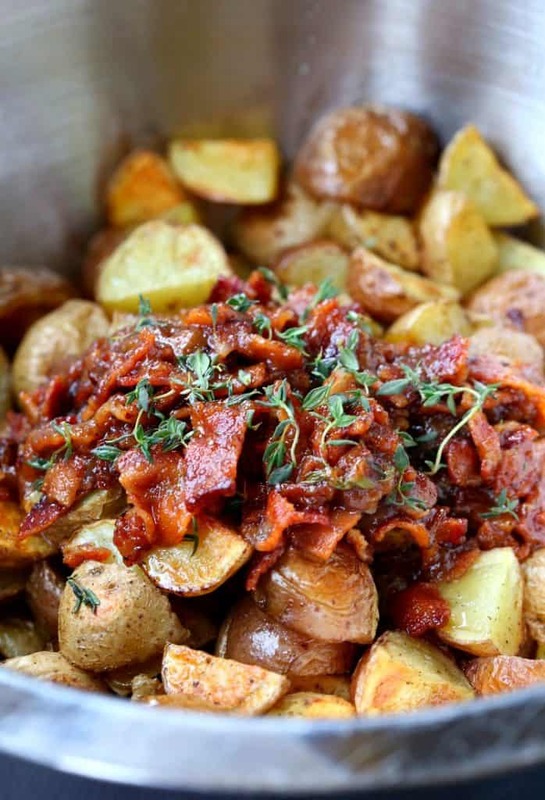 So these Crispy Oven Roasted Bacon Potatoes – you need to make them ASAP. 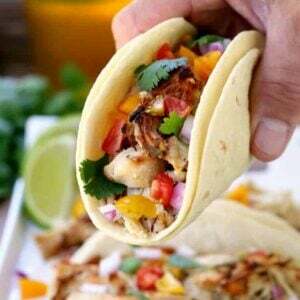 They are so easy to make and so good, I think we’re going to be making them for tons of dinners and parties to come! 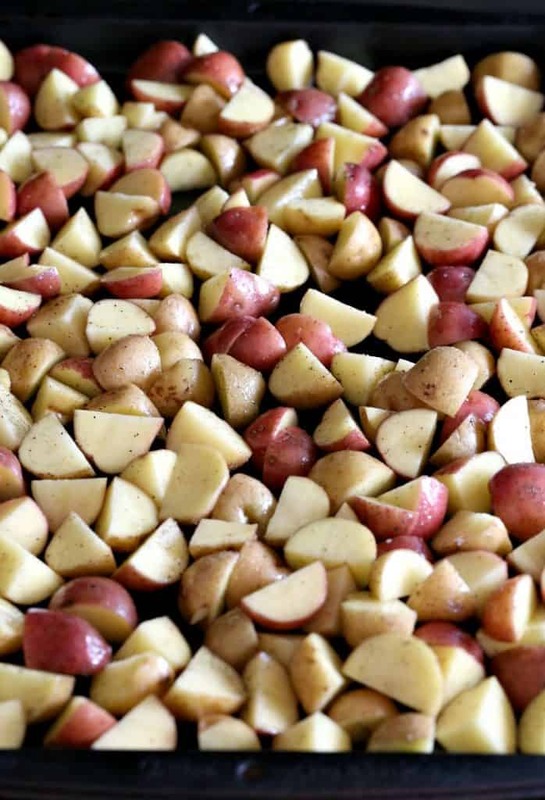 Start out by just cubing potatoes into small pieces like you see in the photos. I used smaller potatoes to get more skin on each one, but you can use whatever size you have, just make sure they are about the same size that I have here. When the potatoes are roasting you can make the skillet dressing. This is a warm dressing, which is perfect for these potatoes so they don’t cool down as you toss them. If you’ve never made a warm bacon dressing before now is the TIME. The dressing is easy, just a few tablespoons of bacon grease…yep bacon grease from the bacon you cooked just before. That is going to swap out for the oil in this dressing so make sure you save it. Then it’s standard dressing making from here, dijon mustard to make the dressing stay together (and for flavor) vinegar, a pinch of sugar, salt and pepper. When the potatoes are done and super crispy, pull the out of the oven and get them into a large bowl to toss with the dressing. If the dressing separates in the pan just whisk it back together before tossing with the potatoes, it’s all going in the same place. Epic, Crispy, Bacony, Potatoes. That’s actually what I should have called these but one bite and you’ll be right there with me. Or just on a Wednesday night next to a burger with the family. 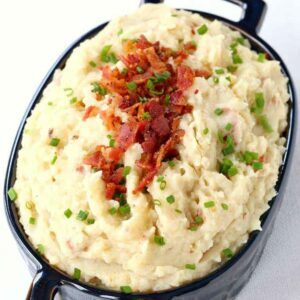 This is going to be a go-to side dish for years to come! Cut the potatoes into a 1 inch dice and place in a large bowl. 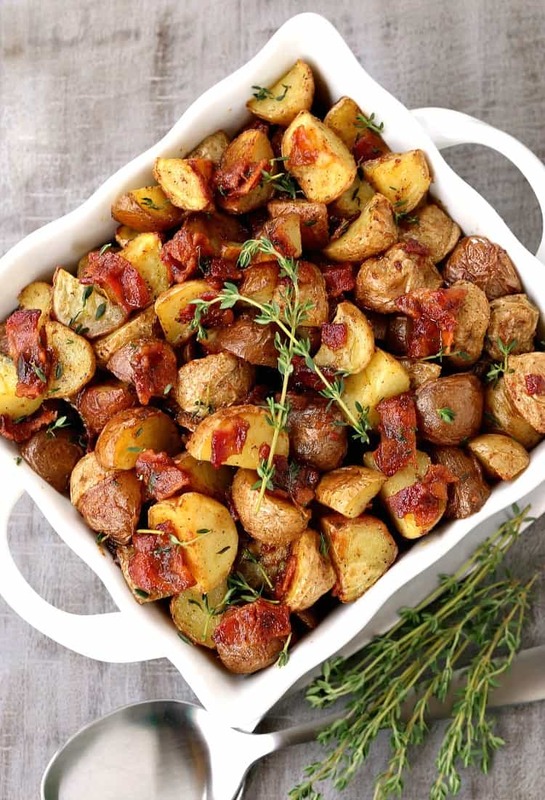 Toss the potatoes with the salt, pepper and olive oil then add to a baking sheet that’s been sprayed with cooking spray. Roast for 40-45 minutes, turning the potatoes halfway through the cooking time. 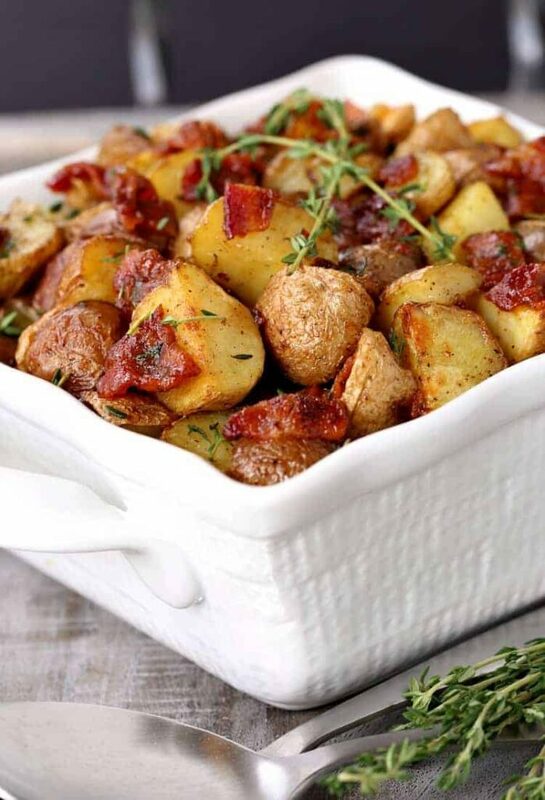 When the potatoes are done place them in a large bowl and then start the bacon dressing. In a small skillet, add the reserved bacon drippings over medium heat. Whisk in the dijon mustard until smooth, then whisk in the vinegar and sugar. Let the dressing come to a simmer then season with salt and pepper to taste. 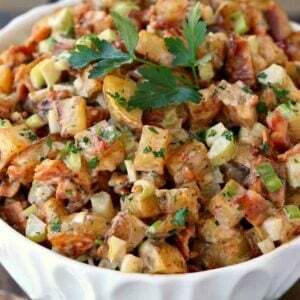 Pour the dressing over the potatoes, add the chopped bacon and fresh thyme leaves then toss to combine.